We love to watch the hummingbirds feeding on our porch. The cats watch them, too, but pretend to not be interested as they know the hummers are much too fast for them ….except when they fly into a window and are knocked unconscious momentarily. After the telltale thump against the window, we quickly ran outside, saw the tiny bird on the deck and chased the cats away. My husband picked him up gently and held him in his hands. 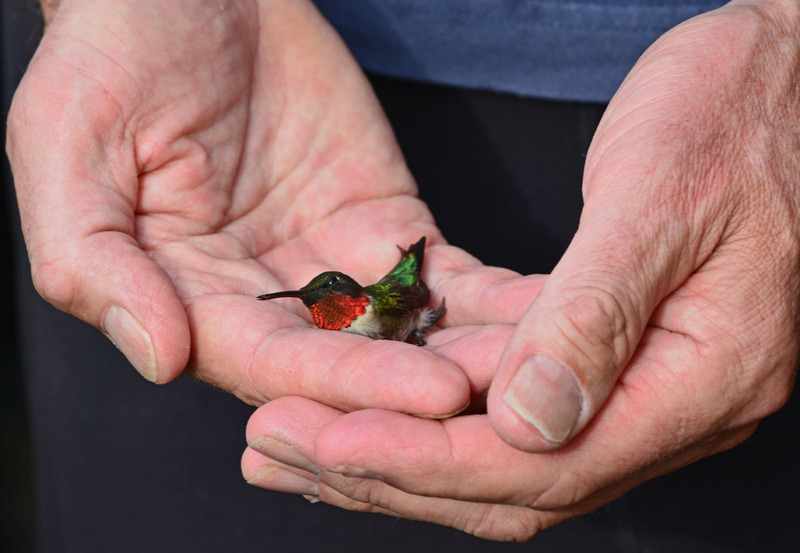 It was a male ruby-throated hummingbird recognizable by the bright red throat coloring. The cats feigned disinterest but kept watching. Another successful bird rescue! I recently posted about a gold finch rescue. 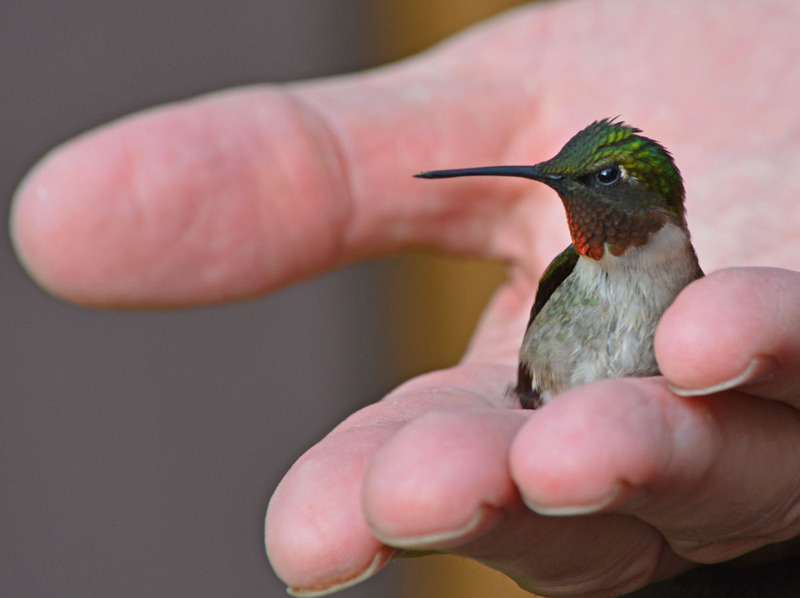 Here is last year’s post on hummingbirds, our avian jewels. This entry was posted in Animals and Critters, Weekly Photo Challenge and tagged cat predator, hummingbird, hummingbird rescue, ruby-throated hummingbird, Weekly photo challenge: Enveloped, window collision. Bookmark the permalink. Aren’t they the cutest little things!? So beautiful and the colours of the feathers….oh I couldn’t let them go …. When the light hits them just right, the red and green iridescent colors are magical. I have never seen the details of the feathers up close like that. Amazing. Congrats on foiling your cats! Life is never boring – this morning, the cat got chased by the dog that got out. Cat karma? I can’t stand not to tell this sad story. Purple martins built a second nest in the steel beam that supports our carport roof. We unwittingly parked the pickup partially under the carport, and our cat jumped off the hood and took down the nest. Boy did we feel dumb. Sorry to hear that – shows you how smart cats are and so willing to use any opportunity. I can sit still and almost touch them as they come up to feed. I love, love, love them. When you sit still, they’ll hover right in front of your face sometimes, checking you out. Gorgeous photos and such a great ending to your story. Thank you, Charlie, we’ve had a string of good endings lately. Wow! We don’t get them in England, but I wish we did. Thank you, David, for re-blogging my post. Amazing shots. So glad to share. I’ve just gotten into watching and feeding hummingbirds and they just amazing! This little guy is beautiful! They are truly little jewels. Yes, we delight in the small victories….thank you, Hanne. They are such tiny critters and hardly weigh anything; “light as a feather” and don’t do any harm to anything else. They are pure treasure and beauty. Wonderful shots. Around here the males are so shy, we hardly see them. Too bad, because the males are usually the prettier ones, with the more flamboyant plumage. Make sure you put something on the window. The problem with the window is that at a certain time of day, it reflects back the outside but still allows you to look in and shows the other window, so it appears as if it is a passageway..
Beautiful story, Annette. With a cute subject! Thank you for stopping by, Lola Jane, and leaving your lovely comment. Oh excellent!! I can picture you scrambling to get your camera, shoo away the cats, and get that picture snapped before the little thing flew away. Perfect post for this week’s challenge. What a fabulous photo op!! I’m so glad you got some photos and that the bird was fine. 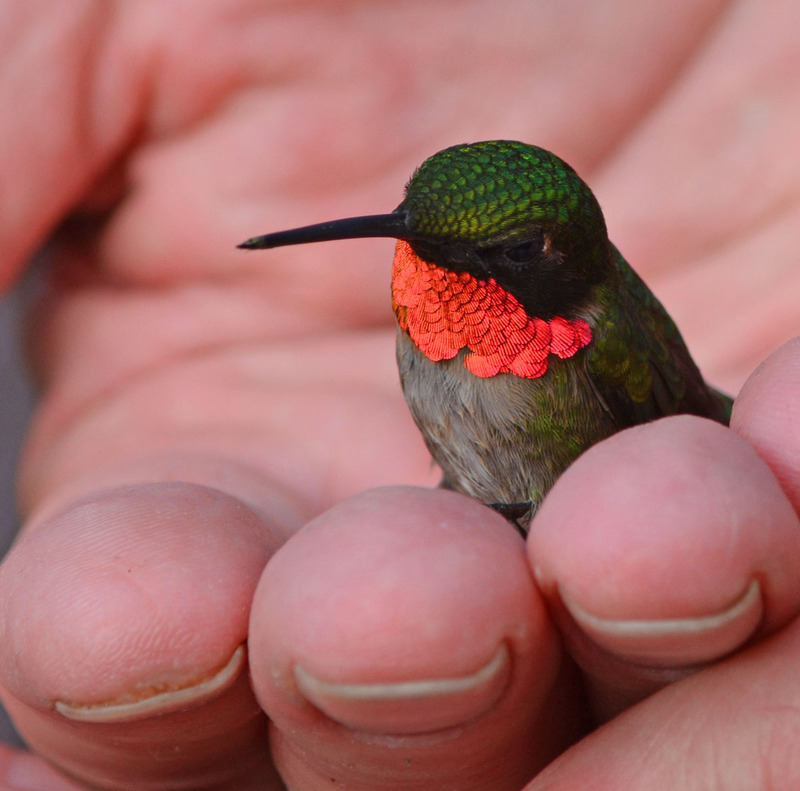 Hummingbirds are beautiful. Thank you, Janet. I am so grateful to have them humming around my house. they are such treasures and bring joy whenever I hear them approaching…. I’ve had the experience of sitting on the porch, wearing something red or near a red cooler, and having the little guys buzz me. They’re so loud and move so quickly. Such a tiny little jewel! I saw our first one of the season yesterday stop by on the deck feeder. I was so excited! Yay – it’s truly spring, then! Exquisite in the close-up detail :). Quite similar to the sunbirds in our eastern hemisphere I. Size and iridescence of feather. Gorgeous little creatures. Just checked out the site and learned a lot. Thanks again, Alex. I love the hummers too! Hello Donkey Whisperer, thank you for visiting and re-blogging! What amazing pictures and what a great rescue! We have some hummingbirds here, too, and they are so much fun to watch. We had a sparrow hit the window so hard it died, so we bought these decal things and since then haven’t had any problems. http://www.amazon.com/Window-Alert-Medley-Decal-5-Pack/dp/B0096UUSPC/ref=sr_1_1?ie=UTF8&qid=1432580257&sr=8-1&keywords=decals+birds+windows Maybe they would help you? Thank you, Xina. I’ve heard mixed reviews about the decals, sometimes they work and sometimes birds attack them! I’ve found a solution for my window – I installed the absent window screen and keep the window open a bit (preventing reflecting illusions for the hummers). That has prevented any crashes since I made the changes. Fingers crossed…. This such a marvel Annette! I thank you for sharing this miraculous event! Thank you, Maria, it’s always a very special event to hold a little creature like that and marvel at it from up close. Precious captures and anecdote, Annette. Having grown up in the Midwest, where hummingbirds are more rare, I was just delighted to see hummingbird after hummingbird in California during a visit there last month. 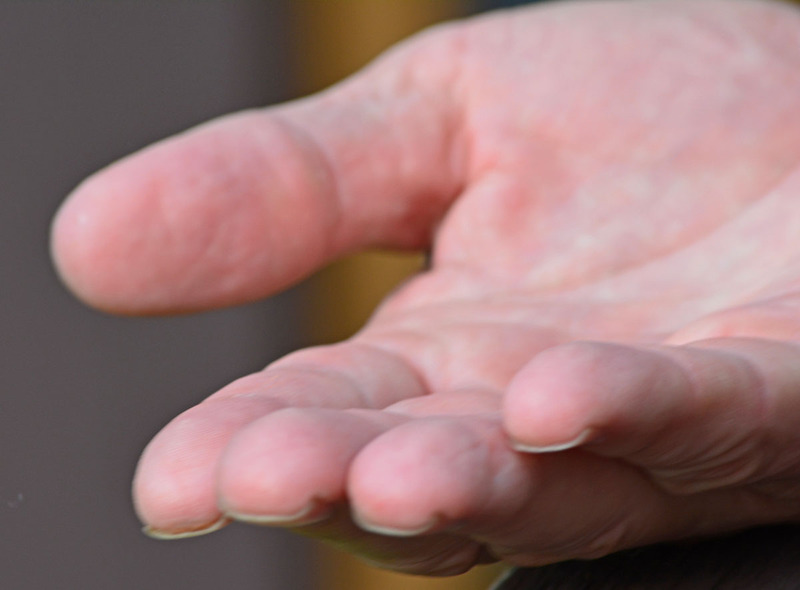 What a treat for you to not only come into close contact with one, but also help ensure its safety. Thank you, Tricia, they truly are precious little creatures. Glad you got a chance to see them in California. How perfectly exquisite, and thank you for sharing the recovery. LOL. He does love to curl up with Momma and enjoyed her milk a very long time. Though he drums a lot better than most cats. I loved this post. I never actually saw a still humming bird till I saw your pictures. oh how wonderful and lucky you are.